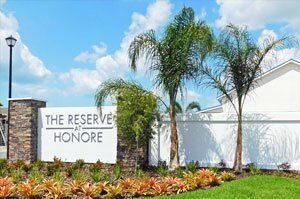 Reserve at Honore is an infill housing development in the historic Bee Ridge area at the southeastern outskirts of Sarasota where many of the city’s “bedroom communities” have been established. 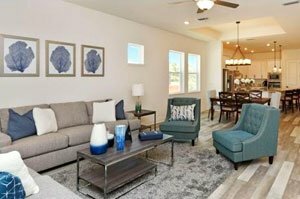 David Weekley Homes of Houston, Texas, launched this homebuilding project in 2017 as part of its expansion into the Sarasota real estate market following the economic recovery after the Great Recession. This residential property development, as its name suggests, is located off Honore Avenue between Proctor and Ashton Roads. A short distance south of its Bee Ridge location is Clark Road which extends eastward to the highway interchange of Interstate 75. Reserve at Honore is platted for just 19 lots laid out on two opposite rows along the community’s single internal street—Twinflower Lane. A pond at the western cul-de-sac of this street and open space buffer the southern perimeter of the Reserve at Honore homes for sale from the neighboring Colony Groves community. Also in the immediate neighborhood of Reserve at Honore is the 18-home Provence community which custom builder Neal Signature Homes opened in late 2015. 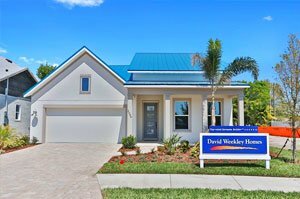 David Weekley offers prospective buyers of Sarasota homes for sale its six choice designs for construction in the Reserve at Honore, with options on one- and two-story builds. These floor plans measure between 2,084 and 3,065 square feet, featuring three to five bedrooms and with price quotes ranging from the $300s and up to the $400s. Buyers can select from David Weekley’s wide-ranging upgrade options that allow the customers to match their choices with their personal tastes and needs. This builder likewise stakes its reputation as a leader in the construction of energy-efficient and high quality homes. It offers to buyers a 10-year limited, transferable warranty. To help whet buying interest on the homes for sale in the Reserve at Honore, David Weekley entered a model home in this community—the Southgate—in the 2018 Sarasota Manatee Parade of Homes. Impressive in its modern farmhouse flair, this stately home comes an open concept layout three bedrooms, two and a half baths within a floor area of 2,400 square feet. A two-story David Weekley design is set for completion too in the Reserve at Honore in 2018. This design, the two-story Rumley, is designed with a floor area of 3,050 square feet good for four bedrooms and three full baths. The Bee Ridge location of these residences makes them a standout amongst buyers, especially young families. Some of Sarasota’s top-rated schools are within this locality including Ashton Elementary and Sarasota Middle. Recreational facilities, like the Urfer Family Park with extensive trails, are plus points too for living in Bee Ridge. Additionally, the Clark Road corridor south of the Reserve at Honore teems with shops and restaurants as well as healthcare facilities. This road’s westward stretch also provides an easy route to the beautiful Gulf Coast beaches of Siesta Key. Trips to downtown Sarasota from Bee Ridge are convenient as well via the other major roads nearby. One of these, Interstate 75, extends access to even more points of interest towards north. These include the Mall at the University Town Center and the Main Street of Lakewood Ranch, both of which sutrly help spur demand on the homes for sale in Bee Ridge. Below are the current real estate listings available at Reserve at Honore.